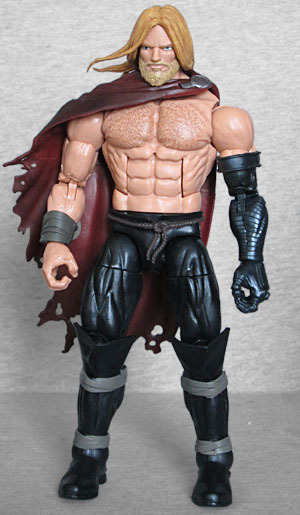 Last year's SDCC Marvel Legends set featured two new figures amidst a bunch of repaints and prepaints, so it wasn't really worth getting. This year's set at least puts the emphasis on the new - three out of the five figures are actually exclusive to the set. 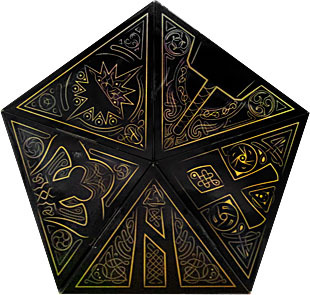 The box is a pentagonal prism with a painting of the characters in an epic battle on a sleeve wrapped around the outside. Take that off, and the whole thing can unroll to reveal each of the figures in its own triangular section, the lid of which has a graphic representing the character within. The back has a poem that goes with each character - just a four-line stanza, but specific to them. I'm not sure whether you're meant to read them left-to-right as they're presented on the back of the box, or in the order that matches the layout of the characters; we'll put both on the blog and you can decide for yourself. On with the show! Betrayer of posterity, redeemed before death. Bor Burison is the former king of Asgaard. During a battle with the Frost Giants, Bor was trapped by a mysterious sorcerer who turned him into snow. Bor called his son Odin for help, saying his sould would rest in the snow until Odin could restore him. Odin, for his part, just told everyone Bor had been killed, and so he became the new king. Bor is a huge figure! Cresting the 8" mark, he'd even look big in a Marvel Select collection. 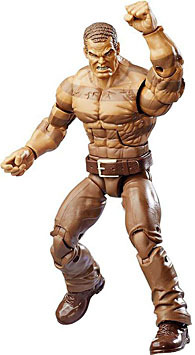 The body is mostly the Absorbing Man/Sandman BAF mold, though you'll never be able to recognize it benath all the new armor pieces. To make him look just like the comics, he's got a new overlapping scale armor shirt that covers his torso and shoulders, a skirt that's a combo of fur and chainmail, chunky metal bracelets, and thick wraps around his shins. The arms aren't the same ones from the BAF mold: they're thinner and longer. Bor's most recognizable feature is his helmet. Like many a pop-culture viking, his hat has horns, though in his case they point down, rather than up. This is such an identifier for him, it was even present when he showed up in the movies (according to the commentary, it wasn't even a physical prop - they didn't have time to build one, so they just made it out of CGI). 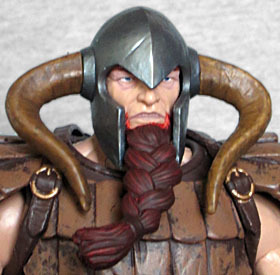 He also rocks a pretty epic beard-braid, which is thicker than some characters' arms. The red paint seems to bleed onto his face a little too much, but this is still a great look. 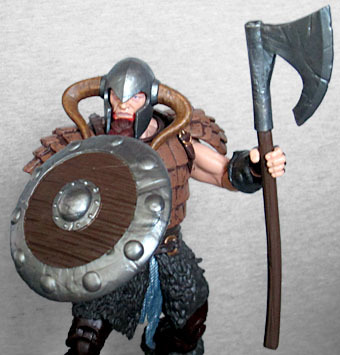 Thor uses a hammer and Odin uses a spear, but Bor's weapon of choice is a bearded axe. It's not given any fancy details, just a plain wooden handle and a scratched up head. He can hold it in either hand, though it's packaged on his left side in the box, and the comics do seem to show him as a southpaw. He's also got a big rustic shield, thick planks of wood with a bumpy metal frame. The shield has one of those clips like Captain America shields use, that allows it to attach to his wrist or plug into his back, but the size of the wrist clip seems wrong for the chosen arms - it's too small for the bracelet, but too thin for the wrist. Dark Elf of Svartalfheim, conspirator among Giants. Malekith the Accursed is kind of Thor's Joker: he's crazy and murderous, and just gets moreso as time goes on. Like Loki, he's a sorceror, but where Loki mostly cares about obtaining power in Asgaard, and does so through underhanded means, Malekith wants to rule everything and is all about using violence to get it. He was chosen as king of the Dark Elves, because they respect things they fear. At one point he decided they'd gotten too soft as a race, and opted for a good old-fashioned genocide. He's not much of a fighter, opting instead for illusions and trickery, which is probably why the movie changed his personality - they didn't want him coming off like a poor man's Loki. Malekith is built on the medium body, and his costume is just as Walt Simonson designed it. 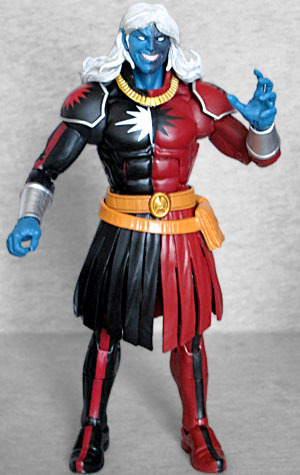 His most defining feature is, well, his defining features: Marvel's Dark Elves have blue skin, but Malekith was born with the left half of his face black. Like, a perfect line down the center of his face. He apparently embraced this bifurcation in adulthood, because the right half of his outfit is black with red accents, while the left is red with black. He has silver bracelets on both arms, and his symbol is a starburst on his chest that's silver on one side, black on the other. His pauldrons and collare are a single separate piece that fits over the toy's neck, with his gold necklace hiding the transition between that and the toy. His skirt and the belt he wears are new pieces, as well - but why two separate ones? In the comics, Malekith is usually found hanging around the Casket of Ancient Winters, which would have been a cool accessory to get here (no pun intended): just imagine a little treasure chest-type thing, with a hinged lid that showed off some snow swirling inside. Neat, right? Instead, Malekith gets a sword. The sword is right out of the comics - he used it to fight Iron Man - but we would have traded that away to get a casket. Possessor of the hammer, Goddess of Thunder. Hey look, it's the new Thor - aka the only reason that anyone remembers the Original Sin crossover happened! Well, that and Angela's origin. Oh, and Silk. Man, Original Sin was good to the ladies! The identity of the new Thor was the driving mystery behind the first few issues of her comic, with lots of suspects and many red herrings and it's Jane Foster. That's who the secret She-Thor is. Jane Foster. Literally the one woman who has anything to do with Thor. That would be like if the Iron Man comics had tried to make a mystery out of who was inside the Rescue armor. Thor is made from a lot of the "thicc" body, though she still gets her fair share of new molds, as well. The winglets on her ankles are separate pieces, so those don't count, but her shins are all wrapped up, which is new, and you know no one wears three small plates of metal armor strapped to their left arm like this. Her skirt and belt are a separate piece, and her billowing cape is a new mold. They had to make a new upper torso for her, because the breastplate she wears needed to be three dimensional, not just paint (though they did get away with that on her stomach - that's supposed to be a gold clasp holding two sides of her shirt together). 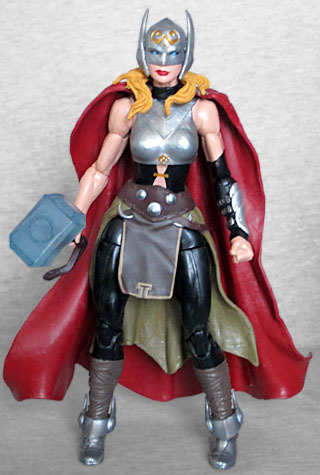 Like the fans, the old Thor initially assumed his replacement was Jane Foster because she was the only woman he knew. But when he looked her up, he found her dealing with cancer and barely able to stand on her own, so he ruled her out. Sucker! Mjolnir transforms her into a healthy body, with the unfortunate downside of making her cancer worse: the transformation may purge poisons from her system, but cancer is natural and chemotherapy isn't. 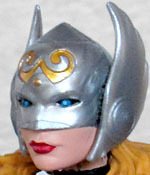 Thor's bullet-shaped helmet covers her eyes and nose, and has stylized metal wings on the sides. Her blonde hair spills over her shoulders, and there's a golden design on her forehead. 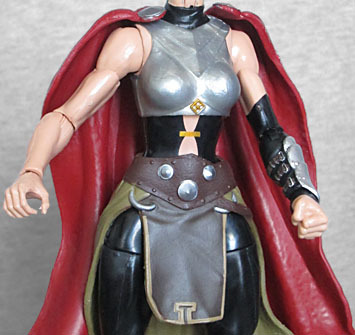 This Thor is also available in the Ragnarok toyline, with the leg of the Gladiator Hulk Build-A-Figure, but there are a few differences, the most noteable of which is that her hammer here is cast in translucent blue plastic, suggesting she's actively using it to control storms. 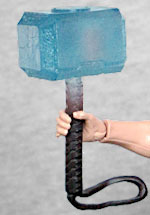 You'll recall that Hasbro's first (relaunched) Marvel Legends SDCC exclusive was also a Thor, and his Mjolnir was also bright blue. Continuity! Unworthy hero, seeker of new purpose. Okay, so. Original Sin was published in 2014. In the final issue, Thor learned a secret that instantly made him unworthy of holding Mjolnir. Like flicking a light switch: one second yes, the next second no. It was only this year that the stories finally revealed what that secret was. Huge moment followed by a huge buildup and then... yeah. Anyway, these days Thor just goes by his last name, Odinson, and looks more like a vagrant than a superhero: he still wears the same kind of boots as before, with the big knee-flaps, but his pants are plain black and held up with a rope belt, he's shirtless, and his red cape is dirty and tattered. 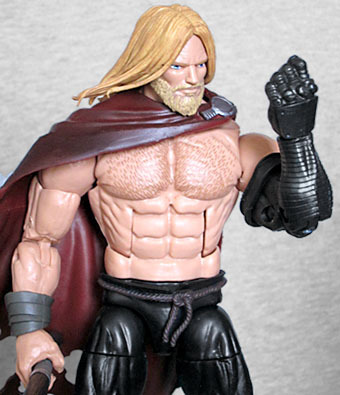 Surprisingly, Odinson's big body is not Hasbro's big body - you'd expect him to use that existing mold, but this one is more detailed and muscular. Are they introducing another new size to their re-use library? Time will tell! The legs appear to be the same, but everything from the pelvis up is wider. In the comic, Thor lost an arm while fighting Malekith, and had a prosthesis forged from "black uru" - that's why he and Bucky can be robo-arm pals! The forearm and elbow are molded with parallel lines, the visual shorthand for cybernetic bodyparts, while the upper arm is just painted grey - the band around the bicep is a separate piece. 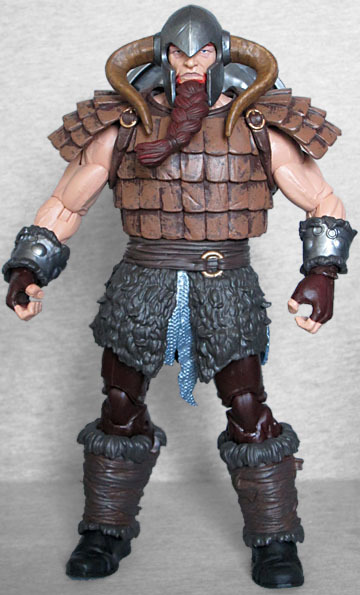 There's a version of this figure in the Ragnarok line, but the differences here are even greater than they were for Thor up above. That figure represents Odinson at an earlier time in his unworthiness, when he still cared about his personal appearance: his cape is brighter and cleaner, he wears a shirt, and he has two arms. Also, thanks to reusing Sentry's head, he's clean-shaven. This one gets an entirely new bearded head, which not only looks better on this toy, but also means you can now create a "homeless" Sentry with a simple head swap! Both this exclusive and the mass market version come with the same weapon: Jarnbjørn, the uru axe Teen Thor used before he earned the right to carry Mjolnir. Like their clothes, mass market Odinson's axe seems brighter than this one's. It's a decent piece and can be held in either hand (or both, if you pose him that way). Commander of the trolls, challenger to Thor. Ulik the Troll [No I don't! That's slander! You can't prove anything! --ed.] was created by Jack Kirby, using the same model that would eventually get pallete-swaped to become Kalibak when he went to DC. The design has shifted slightly over the years, so he looks more distinctive now, but the basics are all there: gigantic orange body, rough skin, some dark fur, green armor, etc. 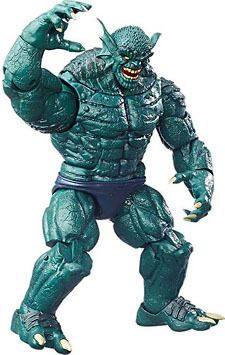 Ulik is based on the Abomination mold, meaning that's now shown up at two SDCCs in a row. The re-use is limited to the legs, groin, and arms. Like Abomination, Ulik onlyhas two toes, but his toenails are flatter and wider, rather than claws, and he has fur on top of his feet. The hands are curled into fists, molded with his "pounders" - basically brass knuckles, but made of uru. The torso is molded with its armor. 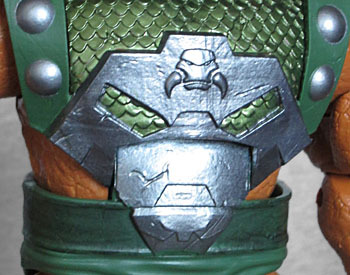 Ulik has a big, vaguely skull-shaped piece of metal cover his abdomen, shiny green scale mail above that, and large green straps with silver studs running over his shoulders. A bit of fur is molded on the shoulders of the armor, which is odd since the existing shoulder molds were already being redone. 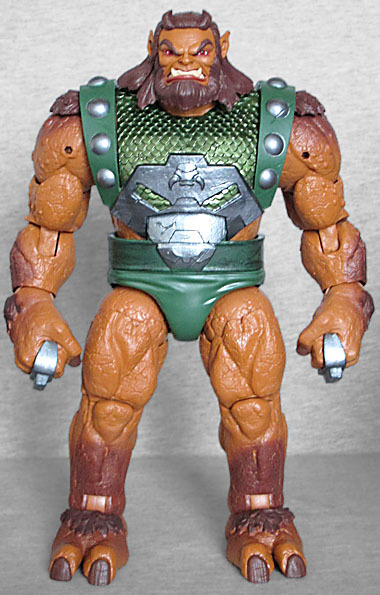 There's a brown airbrushing on his forearms and shins to make them look hairier than Abomination's lizard skin. The head looks nothing like Kirby's art. 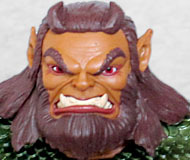 Again: Kirby drew Ulik and Kalibak the same way, with that big, leonine head. This is much tamer, still with a thick beard, sure, but long flowing hair instead of a mane. His pointy ears poke out of the hair, and two little "horns" of hair curl up from his forehead. He has very wide-set eyes (intentionally, for once) and an impressive underbite. Judging by most of the art of him, the head could stand to be even wider than it is - he is a troll, after all, not an enhanced human. The Battle for Asgaard set is a nice one. Although two of the characters are technically available in the normal line, functionally it's only one - Odinson is pretty different in this set, and (if we may say it) better. Bor isn't the most important character ever in the Thor comics, but he's a cool toy, and Malekith and Ulik are longtime enemies getting their first toys. On top of all that, the packaging design is really nice! After 2016's disappointing Raft set, this is a good return to form.